just and true are Thy ways, Thou King of saints. Who shall not fear Thee, O Yahuwah, and glorify Thy name? For Thou only art holy: for all nations shall come and worship before Thee; for Thy judgments are made manifest” (emphasis added). Revelation 14:3 tells us, “And they [the 144,000] sung as it were a new song before the throne, and before the beasts and the elders; and no man could learn that song but the 144,000, which were redeemed from the earth.” Are the 144,000 singing this "new song" on the "sea of glass" as pictured in Revelation 15? In Revelation 15, we see the 144,000 on the “sea of glass” in heaven before the seven plagues are poured out! Can the idea that the 144,000 are on the sea of glass in heaven prior to the pouring out of the vials containing the seven plagues be supported by Elohim’s Word? It will take time to see if this is true, but we need to start at Revelation 10. “And I saw another mighty angel come down from heaven . . . and his face was as it were the sun and His feet as pillars of fire” (Revelation 10:1, emphasis added). We read in Revelation 1:15-16, “And His feet like unto fine brass, as if they burned in a furnace . . . and His countenance was as the sun shines in His strength” (emphasis added). “And He [Yahushua] was transfigured before them: and His face did shine as the sun” (Matthew 17:2, emphasis added). This “mighty angel” is Yahushua! “And He [Yahushua] had in His hand a little book open” (Revelation 10:2, emphasis added). This is not the book which is sealed with seven seals; this “little book” is “open” and not closed and sealed. What book is this? “And I went unto the angel, and said unto Him, Give me the little book. And He said unto me, Take it, and eat it up” (Revelation 10:9). “Thy words were found, and I did eat them!” (Jeremiah 15:16). This “little book” which is “open” is the Bible. Jeremiah, who ate from Elohim’s word in Jeremiah 15:16, tells us Elohim’s “word was the joy and rejoicing of mine heart.” In Revelation 10:9, Yahushua told John to “take it, and eat it up; and it shall make thy belly bitter, but it shall be in thy mouth sweet as honey.” When John “took the little book out of the angel’s hand, and ate it up; and it was in my mouth sweet as honey: and as soon as I had eaten it, my belly was bitter” (Revelation 10:10). Most of us can relate to this; sometimes, what we eat is “sweet as honey,” but acid-indigestion can set in (“my belly was bitter”). Oh, why did I eat that? If I had only known what the end result would be! At times, even when we know what the result will be, we eat something just the same because we like it and are willing to endure the after effects. But it is Yahushua Who is telling us to eat. Would He give us something that was not for our best interest? Absolutely not! Yahushua forewarned John, and He is forewarning us of what is to take place after eating “the little book;” what will take place after we comprehend the truth which the little book contains: “my belly was bitter” (Revelation 10:10). The comprehension of truth is a very “sweet” experience, but why does it turn “bitter?” Webster’s Dictionary tells us that bitter can mean “hard to bear;” the opposition and hatred encountered as the truth that is discovered, is shared or proclaimed is hard to bear, as has been the experience of Elohim’s servants throughout time. Such was Ezekiel’s experience when he was told to “Eat that thou find; eat this roll [scroll – books were not in existence in Ezekiel’s time], and go speak unto the house of Israel. So I opened my mouth, and He caused me to eat that roll. [Only the Spirit of Elohim can enable you to digest (understand) Elohim’s Word.]. And He said unto me, Son of man, cause thy belly to eat, and fill thy bowels with this roll that I give thee. Then did I eat; and it was in my mouth as honey for sweetness” (Ezekiel 3:1-3). It was “as honey for sweetness” in Ezekiel’s mouth, just as it was portrayed by John in Revelation 10:10, but relating Elohim’s message to the house of Israel would be a “bitter” experience for the prophet Ezekiel. Just as it was told to Jeremiah, we can be certain that Ezekiel was told, to “diminish not a word” (Jeremiah 26:2). When Ezekiel ate the scroll, he was to relate to the “house of Israel” what it was that Elohim had shown to him, and it was not a message of peace and safety but one bearing eternal consequences for those to whom it was to be given. He was to give it “whether they will hear, or whether they will forbear” [‘refuse to hear’ Amplified Version] (Ezekiel 3:11). Ezekiel was to be “a watchman unto the house of Israel: therefore hear the word at My mouth, and give them warning from Me” (Ezekiel 3:17). Elohim’s servants have nothing to do with the results of the message they bear from Elohim; they are to deliver it without fear or favor of man as the straight testimony from Elohim without diminishing a word! Who are the most receptive to Yahuwah’s messages of warning? “For thou art not sent to a people of a strange speech and of an hard language, but to the house of Israel; not to many people of a strange speech and of an hard language, whose words thou canst not understand. Surely, had I sent thee to them, they would have hearkened unto thee. But the house of Israel will not hearken unto thee; for they will not hearken unto Me: for all the house of Israel are impudent and hardhearted” (Ezekiel 3:5-7, emphasis added). Elohim was talking to Ezekiel about the ancient nation of Israel in the above passage and to the so-called professed believers in Yahushua of our time. Many make great professions, but their lives lack the evidence of the fruit of the Spirit. Should we be surprised or discouraged if they do not listen to what we are sharing with them? They do not even listen to Elohim! But when the message is given with “latter rain” power during the last days, “many people of a strange speech and an hard language” will hear and accept Elohim’s message of grace and mercy and will become a part of the “great multitude” pictured in Revelation 7:9. It was not the religious people in the days of Messiah who received the message of salvation but publicans and sinners. The religious people in Messiah’s day put Him to death because He exposed their hypocrisy. Yahushua said, “They that are whole need not a physician; but they that are sick. I came not to call the righteous [self-righteous], but sinners to repentance” (Luke 5:31-32). The publicans and sinners realized their need and sought healing for their sin-sick souls while the religious people of that day felt they were good enough. Pride feels no need. If we are being applauded (that seems to be acceptable and what is desired within the church today), and if that is what we desire, we may not be meeting the mind of Elohim. We cannot tell who will hear or who will not, but we must not be neglectful in whatever duty Elohim places upon us. Elohim made Ezekiel “a watchman unto the house of Israel” (Ezekiel 3:17). Has Elohim made you “a watchman unto the house of Israel?” “For unto whomsoever much is given, of him shall much be required” (Luke 12:48). Elohim will help and strengthen you in discharging those duties He places on you. If you desire respect more than carrying out Elohim’s desire, you are not going to be able to be “a man after Elohim’s Own heart:” those who are seeking to serve Him and not please man. We must understand that the religious people will like us no more than they liked Yahushua when He walked this earth. Yahushua told us, “Blessed are ye, when men shall revile you, and persecute you, and shall say all manner of evil against you falsely, for My sake. Rejoice, and be exceedingly glad [not an easy thing to do]: for great is your reward in heaven: for so persecuted they the prophets which were before you” (Matthew 5:10-12). After eating the book and experiencing the sweetness in the mouth and the bitterness in the belly, the angel “said unto me [you], Thou must prophesy again before many peoples, and nations, and tongues, and kings” (Revelation 10:11, emphasis added). This is the same group we find mentioned in Revelation 7:9 with the addition of “kings.” The message is to be given to the entire world but will not be accepted by all, especially those who are powerful and influential. We will be prophesying because we have been eating from the “little book” that is “open” as seen in Revelation 11:3. John was not going to be prophesying after he had received the “Revelation of Yahushua Messiah.” We, for whom the book of Revelation was written, will be telling people what is about to happen and why! Revelation chapter 11 is a continuation of the scenario begun in Revelation chapter 10. “And there was given me a reed like unto a rod [‘measuring rod’ NAS]; and the angel stood saying Rise, and measure the temple of Elohim, and the altar, and them that worship therein. But the court which is without the temple leave out, and measure it not; for it is given unto the Gentiles: and the holy city shall they [‘the Gentiles’] tread under foot forty and two months” (Revelation 11:1-2, emphasis added). “No prophecy of Scripture is of any private interpretation” (2 Peter 1:20). Scripture interprets other Scriptures. We want to take Elohim’s Word in its most literal sense unless a symbol is used. We find symbolism in Revelation 11, but first we want to look at it for its obvious meaning. “For the time is come that judgment [‘measure the temple of Elohim . . . and them that worship therein’] must begin at the house of Elohim” (1 Peter 4:17). Those who profess to worship Elohim will be the first to be judged. “And Yahuwah said unto him, Go through the midst of the city, through the midst of Jerusalem, and set a mark upon the foreheads of the men that sigh and that cry for all the abominations that be done in the midst thereof” (Ezekiel 9:4). Are you “sighing and crying over the abominations” being perpetrated in the world and especially in the “Christian church” today, including gay marriage, homosexuality, transgender, pedophilia, law suits by churches against individuals, false doctrines, ritualism, the acceptance of paganism’s practices, beliefs, and customs in the community of believers, and the non-acceptance of the Word of Elohim as the final authority among believers? All these things are giving a false witness to what Christianity is really all about. Elohim will judge mankind, and He will begin “at the house of Elohim” (1 Peter 4:17) because they make such a high profession of serving Him, while all the time denying His authority to rule in their lives. We are liable for the results if we fail to read and follow the owner’s manual for a product when it breaks or fails due to our negligence. We are told in 3 John 2 that Elohim wishes “above all things that thou mayest prosper and be in health.” If we would simply follow the instruction given in the Bible by Elohim, there would be far less sickness and disease among Elohim’s professed people. “I lifted up mine eyes again, and looked, and behold a man with a measuring line in his hand. Then said I, Whither goest thou? And he said unto me, To measure Jerusalem [‘the holy city’ (Revelation 11:2)] to see what is the breadth thereof, and what is the length thereof” (Zechariah 2:1-2, emphasis added). Was he measuring the city or was he measuring the inhabitants of Jerusalem (“them that worship therein”) as is seen in Revelation 11:1? See Ezekiel 9:5-11. “But the court which is without the temple leave out, and measure it not [at least not yet]; for it is given unto the Gentiles; and the holy city shall they [‘the Gentiles’ – those who are not of spiritual Israel] tread under foot forty and two months” (Revelation 11:2). The Gentiles shall tread under foot forty and two months the holy city until the times of the Gentiles be fulfilled (Luke 21:24). Was the city of Jerusalem trodden under foot for forty-two literal months or forty-two prophetic months (twelve hundred and sixty years)? Have the Gentiles trodden down Elohim’s people ("the holy city") for forty-two literal months or for twelve hundred sixty years? There is no indication that this is referring to the papacy. Elohim’s people have been persecuted by unbelievers since Cain killed Abel, or in the New Testament times since AD 34, so “prophetic time” (a day for a year) has never worked for the forty-two months in Revelation 11:2. But Elohim’s true people, who compose “the holy city” or “Jerusalem,” will be persecuted (“trodden down”) by the Gentiles for forty-two literal months beginning thirty days after the “time of trouble” begins, spoken of in Daniel 12:1. “And I will give power unto My two witnesses, and they [‘My two witnesses’] shall prophesy a thousand two hundred and three score days clothed in sackcloth. These [‘My two witnesses’] are the two  olive trees and the two  candlesticks [‘lampstands’] standing before the Elohim of the earth” (Revelation 11:3-4, emphasis added). Who are the “two  witnesses?” In Revelation 11:3-4, they are symbolized as “the two olive trees and the two candlesticks.” “Thy word is a lamp [‘candlestick’ or ‘lampstand’] unto my feet, and a light unto my path” (Psalm 119:105). The two candlesticks represent the Old and the New Testaments, but what do the “two olive trees” symbolize? “And the foolish [virgins] said unto the wise [virgins], give us of your oil; for our lamps are gone out” (Matthew 25:8, emphasis added). The Bible, the lampstand, is of no use without “oil.” In Revelation 11:4, there are “two olive trees,” just as there are “two olive trees” in Zechariah 4 symbolizing the two phases of the work of the Holy Spirit – the early and the latter rain – the cleansing and empowering of Elohim’s Spirit. From the “two olive trees” comes the “oil” which symbolizes Elohim’s Spirit. It is not sufficient to merely have an intellectual knowledge of the Old and New Testaments. One must have the “oil” of the Holy Spirit or else one is “foolish” and for whom the “door was shut” (Matthew 25:10), and Yahushua will say to those who are foolish who have no oil, “I know you not” (Matthew 25:12). No amount of pleading will prevail; see Matthew 25:11. Probation had closed for the “foolish” virgins. “The door was shut” (Matthew 25:10). Saddest of all words that ever fell on mortal ears are those words of doom, “I know you not” (Matthew 25:12). The Holy Spirit’s mission makes Elohim’s Word a “lamp unto our feet” for the Spirit of Elohim will guide us into all the truth (John 16:13). Without the Spirit of Elohim, our lamps will go out, and we will not see our way clearly, understand the truth for the times in which we live, and our characters will not have been cleansed and transformed, and then empowered for service. So who are the two witnesses - the “two olive trees, and the two candlesticks?” Can I say that they represent a group of people we have met previously in this chapter? Revelation 15 described a group of people in heaven singing a song only they could sing who I said were the 144,000. As we continue looking at Revelation 11, we will see what those individuals will be doing on the earth and how they come to be in heaven before the seven last plagues are poured out. In Revelation 11:2-3, two separate times are mentioned; forty-two months and twelve hundred and sixty days; these same time lengths are given in two different units of measurement. What was the reason for this? They are for two different groups and which begin at two separate times. The “Gentiles” will tread down the holy city for forty-two months and the two witnesses will give their testimony for twelve hundred and sixty days. They also have different starting times. The twelve hundred and sixty days connected to the two witnesses begin at the opening of the time of trouble marked by the first global earthquake. The forty-two months begin thirty days later when the New World Order takes control of this earth; the New World Order is represented by the first beast of Revelation 13 and is in power for forty-two months (Revelation 13:5), as are the Gentiles in this chapter, and the ten toes in Daniel 2:44 and is also mentioned in Daniel 12:7. In Chapter 15 on Daniel 12, we will see how on the preparation day of the Passover in the future, the global earthquake we saw occurring in Revelation 8:5 will signal the beginning of the “time of trouble” spoken of in Daniel 12:1. At this point in time the 144,000 will begin giving their testimony for 1,260 days. They will be empowered by the latter rain of Elohim’s Spirit, and they will have an understanding of Elohim’s Word, the Bible, which they obtained because they have followed the counsel found in Revelation 10:9-11. Joel 2:23 tells us, “Be glad then, ye children of Zion, and rejoice in Yahuwah your Elohim: for He hath given you the former rain moderately, and He will cause to come down for you the rain, the former rain, and the latter rain in the first month” which coincides with the time of the preparation day of the Passover. They will have experienced what the “Two Witnesses” were representing. They have the knowledge of the Old and New Testaments; especially the prophecies and have received the “oil” of the early and latter rain – the cleansing and empowering power of the Spirit of Elohim. “And it shall come to pass afterward, that I will pour out My Spirit upon all flesh; and your sons and your daughters, shall prophesy, your old men shall dream dreams, your young men shall see visions: and also upon the servants and upon the handmaids in those days will I pour out My Spirit” (Joel 2:28-29). “Thy watchmen shall lift up the voice; with the voice together shall they sing: for they shall see eye to eye, when Yahuwah shall bring again Zion” (Isaiah 52:8). Just like at Pentecost, Elohim’s servants and handmaids will be united and in harmony with one another. When people sing together there must be harmony with no discord if people are going to want to listen to you sing, and so it will be with the 144,000 just as it was on the day Pentecost nearly 2,000 years ago. “They were all with one accord in one place” (Acts 2:1). The 144,000 will not be in “one place’ as it was at Pentecost,” but just like when the Spirit of Elohim fell on the seventy elders in the wilderness “there remained two of the men in the camp, the name of the one was Eldad and name of the other Medad: and the spirit rested upon them . . . and they prophesied in the camp” (Numbers 11:25-26). The 144,000 will be scattered throughout the earth at the time of the first global earthquake, and Elohim’s Spirit will fall upon each of them wherever they are and the work foretold in Revelation 11 will be seen wherever they may be at. “And if any man hurt them [the Two Witnesses – the 144,000], fire proceeds out of their mouth, and devours their enemies: and if any man will hurt them, he must in this manner be killed. These [the 144,000] have power to shut heaven, that it rain not in the days [‘a thousand two hundred and three score days’] of their prophecy [‘thou must prophesy’ (Revelation 10:11)]: and have power over the waters to turn them to blood, and to smite the earth with all plagues, as often as they will” (Revelation 11:5-6). “Wherefore thus saith Yahuwah Elohim of hosts, Because ye speak this word, behold, I will make My words in thy mouth fire, and this people wood, and it shall devour them” (Jeremiah 5:14). In the days of Elijah fire came down from Elohim and consumed those men who came to arrest him. See 2 Kings 1:9-15. The 144,000 are "Elijah" who we are told will come “before the coming of the great and dreadful day of Yahuwah” (Malachi 4:5). “Not by might, nor by power, but by My Spirit, saith Yahuwah of hosts” (Zechariah 4:6). Will Elohim be giving the Old and New Testaments and the early and the latter rain this type of power, or to those who are eating from the “little book open?” In addition to what it says in Revelation 11:5-6, they will also be prophesying (Revelation 11:3) what is to come and very likely will be healing the sick, raising the dead, casting out demons, restoring sight to the blind and hearing to the deaf and speech to the dumb. “And these signs shall follow them that believe; In My name (Yahushua) shall they cast out devils; they shall speak with new tongues; they shall take up serpents; and if they drink any deadly thing, it shall not hurt them; they shall lay hands on the sick, and they shall recover” (Mark 16:17-18). They will not be taking up serpents or drinking poison to prove anything as Satan tempted Yahushua to do when he told Him to jump from the Temple pinnacle to prove that He was the Son of Elohim (Matthew 4:5, Luke 4:9). Yahushua told His disciples to “Heal the sick, cleanse the lepers, raise the dead, cast out devils” (Matthew 19:8), but they were not to rejoice in this, “but rather rejoice, because your names are written in heaven” (Luke 10:20). “And when they [the 144,000] shall have finished their testimony [‘twelve hundred sixty days’ after they began], the beast that ascended out of the bottomless pit shall make war against them, and shall overcome them, and kill them” (Revelation 11:7, emphasis added). When Yahushua was on earth He could not be harmed while any of what He referred to as “twelve hours in the day” remained (John 11:9). He was allotted a certain period of time for His ministry and while any of that time remained He could not be harmed and so it is with the 144,000. They will have 1,260 days to finish their testimony and when that period is completed they will be killed by the Devil. In our study of Revelation 9, we saw that Satan had been given the “key to the bottomless pit” and had come out, or had “ascended out of the bottomless pit.” All the 144,000 will be put to death by Satan for his hate is great towards them! Yahushua told the people of His day, “You are of your father the devil, and lusts of your father you will do. He was a murderer from the beginning, and abode not in the truth” (John 8:44, emphasis added). We have no known record of Satan ever killing anyone until we come to Revelation 11:7 where we are told Satan kills the 144,000, and yet Yahushua told us that Satan was a “murderer from the beginning.” In order for Satan to be fully exposed for what he began in heaven, it will have taken over 6,000 years for it to be seen what he would become. Just like an oak tree is not seen for what it is when it is just an acorn, so Satan could not be seen for what he was to become until his character will be fully manifested. “He was a murderer from the beginning,” but the loyal angels and the other inhabitants of the Universe could not have known that when Satan began his rebellion in heaven over 6,000 years ago. “And their dead bodies shall lie in the street of the great city, which spiritually is called Sodom and Egypt [The prophets of Elohim often referred to Israel as Sodom or Egypt (Isaiah 1:9-10, Jeremiah 23:14)], where also our Master was crucified [Jerusalem]. And they of the people and kindreds and tongues and nations shall see their dead bodies three days and an half, and shall not suffer their dead bodies to be put in the graves. And they that dwell upon the earth shall rejoice over them, and make merry, and shall send gifts to one another; because these two prophets [‘two witnesses’ are now referred to as ‘these two prophets’] tormented them that dwelt on the earth. And after three days and an half the Spirit of life from Elohim entered into them, and they stood upon their feet; and great fear fell upon them which saw them. And they heard a voice from heaven saying unto them, Come up hither. And they ascended up to heaven in a cloud; and their enemies beheld them, and the same hour was there a great earthquake, and the tenth part of the city fell, and in the earthquake were slain of men seven thousand: and the remnant were affrighted, and gave glory to the Elohim of heaven” (Revelation 11:8-13, emphasis added). Everything you have just read above is to be literally fulfilled; the only symbolism is the “two prophets” which has been changed from the “two witnesses” as used earlier in this chapter and the name “of the great city” being called “Sodom and Egypt” being the city of Jerusalem. The prophets of the Old Testament often referred to Jerusalem as Sodom or Egypt (Isaiah 1:9-10, Jeremiah 23:14, Amos 4:11). Many of the concluding events of the last days before the return of Yahushua will take place in Jerusalem, for Satan has been preparing earth’s inhabitants for his greatest deception. The “two prophets” (144,000) ascend up to heaven in a cloud just as Yahushua did (Acts 1:9) when He was taken to heaven, and we can be assured that just as the disciples gazed into heaven until Yahushua had disappeared from sight, so the “remnant” will also be gazing into the heavens trying to catch the last glimpse of the 144,000. We see that the seven last plagues have not been poured out at this time when the 144,000 are taken to heaven. The time frame is “the second woe is past; and, behold, the third woe cometh quickly” (Revelation 11:14). The “second woe” we have seen is the sixth trumpet. Sometime after one-third of earth’s inhabitants are killed in the war pictured in Revelation 9:13-18 and Daniel 11:40, the 144,000 are brought to Jerusalem and are put to death, and three and a half days later they are brought back to life and taken to heaven. The third woe is the seventh trumpet which is the seven plagues, as pictured in Revelation 16. We saw that the 144,000 are on the “sea of glass" before the seven plagues are poured out. Can we see that the “two witnesses” or the “two prophets” are the 144,000? They will be doing the prophesying and causing the waters to turn to blood and smiting the earth with plagues. They also cannot be harmed until their twelve hundred and sixty days are completed, just as Yahushua could not be harmed until the “twelve hours in the day” (John 11:9) were completed during His ministry. Yahushua’s enemies attempted to harm and even kill Him, but He could not be harmed until His allotted time was fulfilled. So it will be with the 144,000. The 144,000 will have so close a walk with Elohim that He will entrust them with great powers for healing people and for harming the earth, but nothing in comparison to when Elohim pours out the seven plagues upon the earth and its inhabitants. “The people that do know their Elohim shall be strong to do exploits and they that understand [the 144,000] among the people shall instruct many [‘great multitude’ (Revelation 7:9)]” (Daniel 11:32-33). The 144,000 will be singing the song of Moses and the Lamb because their experience will be somewhat similar to that of Moses and Yahushua who both died and were brought back to life before they saw corruption. In Revelation 14 we read, “And I looked, and lo, a Lamb stood on the mount Sion, and with Him an hundred forty and four thousand, having His Father’s name written in their foreheads. And I heard a voice from heaven, as the voice of many waters, and as the voice of a great thunder: and I heard the voice of harpers harping with their harps: and they sung a song as it were a new song before the throne, and before the four beasts, and the elders: and no man could learn that song but the hundred and forty and four thousand, which were redeemed from the earth. These are they which were not defiled with women; for they are virgins. These are they which follow the Lamb whithersoever He goeth. These were redeemed from among men, being the firstfruits unto Elohim and to the Lamb. And in their mouth was found no guile: for they are without fault before the throne of Elohim” (Revelation 14:1-5). Just as Yahushua was the first fruit presented to Elohim when He was resurrected, so the 144,000 are the first fruit presented to Elohim before Yahushua returns to the earth to resurrect and rescue His people. We have pictured in Revelation 11:19, “And the temple was opened in heaven, and there was seen in His temple the ark of His testament: and there were lightnings, and voices, and thunderings, and an earthquake, and great hail.” The last part of this verse is identical to what is written in Revelation 16:18-21 when the seventh vial is poured out. The earthquake and the hail, being described in these two portions of Scripture, are the same. The Day of Atonement was the concluding event in the sacrificial services and took place on the tenth day of the seventh month of the Biblical Calendar and was the only time when the “ark of His testament” could be seen. Back in Revelation 15:8 we read, “And the temple was filled with smoke from the glory of Elohim, and from His power; and no man was able to enter into the temple, till the seven plagues of the seven angels were fulfilled.” In Leviticus 16 in describing the Day of Atonement and what took place, we find nearly the same words being spoken. “And there shall be no man in the tabernacle of the congregation when he goes in to make an atonement in the holy place, until he come out, and have made an atonement for himself, and for his household, and for all the congregation of Israel” (Leviticus 16:17). When we come to Chapter 15 of this book dealing with Daniel 12, we shall see the order of concluding events in this world prior to the return of Yahushua. The Fall Feast Days listed in Leviticus chapter 23 form the time line for those events. What had been foreshadowed in the Old Testament in the sanctuary service meet what were the actual events that were foretold. It was a compacted prophecy. “Thy way, O Elohim, is in the sanctuary” (Psalm 77:13). 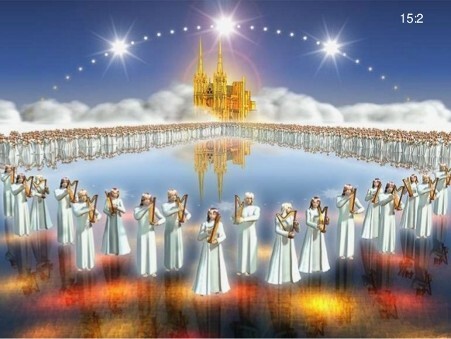 1. Who is the group seen in heaven before the seven last plagues are poured out? 2. Who are the “two witnesses” or the “two prophets” and what will they be doing? 3. How long will the 144,000 prophesy? 4. How long will the Gentiles persecute Elohim’s people? 5. Who kills the 144,000 and where will he do it? 6. Who is the angel described in Revelation 10:1?